If you own an automotive garage, then you may already be familiar with TIDDOX's CLASSIC JUMBO ROLL. These automotive wipes are strong, absorbent, and affordable. Not only that, they are disposable! It just doesn’t get much better than that! Our customers often use the JUMBO ROLL DISPENSER, a free standing floor dispenser that keeps these automotive rags handy for your workers. The dispenser is portable and lightweight yet, just like our mechanic towels, very tough. These green towels will replace the ubiquitous rags the first time you try them. Recycled T-Shirt rags are bulky, inconsistent in absorbency and size, and not the most hygienic option by comparison to 600 standard sized wipers (50cm x 30cm) wrapped on a roll the same size as a standard 10 kg bag of rags. They are perforated so easy to tear off and handy for wiping off an oil dipstick, or wiping up an oil spill on the floor. These green towels include polyester fibers that are otherwise nearly impossible to tear. This makes them perfect for scrubbing auto parts and tools. They won’t leave bits of cloth or paper on sharp corners. In addition, this fabric also contains high amounts of the absorbent viscose material. This means that, much like a sponge, the mechanic towel will pull fluids into it, preventing the spill from getting worse. Even better, because of the high viscosity the cloth will soak up thick fluids such as motor oil, grease, and anti-freeze. Try TIDDOX's CLASSIC JUMBO ROLL of garage wipers with your next order, and you’ll never want another towel! 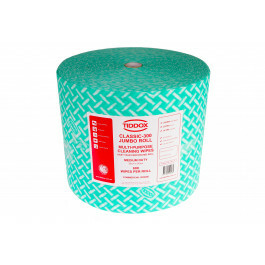 Other related products from TIDDOX's automotive range of cleaning wipes are the JUMBO RHINO ROLL, the JUMBO ROLL FLOOR DISPENSER, and the SHAMMY WASH CLOTH.